TradeNet honored as A+ Supplier… Again! TradeNet is pleased to receive a 2016 A+ SAGE Rating Award for providing excellent service and products. The rating continues an ongoing string of SAGE A+ designations for TradeNet. TradeNet is a leading supplier of printed promotional products ranging from magnets, to dry erase boards, to calendars, to Sticky Notes, to scratch pads, to direct mail and more. Distributors from across the nation obviously appreciate the diversity, quality and economy of TradeNet’s Your Message Your Way® product line. 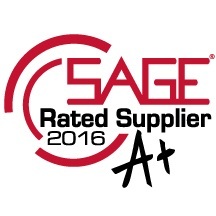 SAGE A and A+ ratings are awarded each year to top industry suppliers based on a distributor rating system from SAGE, a primary product research system in the promotional products industry. Distributors rate suppliers on a variety of criteria and decide which suppliers to use. As part of the business relationship between SAGE and PPAI, the SAGE rating makes TradeNet eligible for the industry’s annual PPAI Supplier Star Awards Competition. TradeNet is accustomed to having an A+ SAGE rating, but it’s still great to be able to hold it up when the report card comes out. It’s really no secret why TradeNet has emerged as the top producer of magnets for the promotional products industry. When it comes to pricing, quality and service, there’s no beating the overall value of the Your Message Your Way® line of magnets as produced by TradeNet. TradeNet has perfected the magnet production process from start to finish. Customers are assured of getting a durable, brilliant color magnet for virtually all messaging purposes. Indoor. Outdoor. Large. Small. Custom shaped. Picture frames. Automotive. And more! Plus, TradeNet does not charge set-up or four-color processing fees, offers free art time and gives discounts for online ordering. Various thicknesses allow customer choice. Delivery is prompt and all associated freight charges are known at the time the order is placed. No surprises! Magnets remain a great marketing tool because they deliver customized messaging day in and day out. When a magnet has creative flair, color that “pops” and strong stick, be assured it’s from TradeNet. Visit www.TradeNetOnline.com for product views and ideas. PPB Magazine — one of the top publications serving the promotional products industry — has offered up a day in the life of one of TradeNet’s finest in its May 2015 issue. Scott Perry, Director of Pre-Production Services, was the focus in one of the magazine’s ongoing series about key people in the industry. Thanks to PPB for bringing to everyone’s attention a TradeNet manager who fully ascribes to the value customer service brings to all TradeNet products. The article is a fun read and we at TradeNet even learned a few things about Scott. Click here to check out Page 84 of this month’s PPG Magazine. Knowing the status of the order you placed with TradeNet is as handy as your phone. Our newly installed Automated Order Status Attendant gives 24/7 access to the information you want. It’s easy to use, too. Simply call TradeNet any time at 800-884-7301 and press “6.” Use your telephone keypad to enter your DisbributorCentral order number and you’ll hear an updated status report. If the order has already been shipped, you can Press 1 to hear the shipping method and tracking number. As always, TradeNet stands ready to provide personal assistance during regular office hours. If your order is in production and you have questions, press “1” to speak to the next available Customer Service Representative. Automated Order Status Attendant is another example of TradeNet doing what it takes to help you sell.